As I began my fourth round of P90X, my rationale for continuing on with a P90X/Insanity hybrid was simple: if it ain’t broke, don’t fix it. Specifically, that regimen was yielding very good results. But two-thirds of the way through that fourth round, my exertions from six day/week workouts, tennis and hiking were combining to take a toll. I injured my knee in the midst of an Insanity routine. I muddled along, as best I could, modifying most of the plyometric activity in my workouts, and finished Round 4, still with good results. But something needed to change. I took a month off and focused on rest and rehab to nurse the knee back. I knew that if I was going to continue with P90X, I needed to cut back and re-focus my efforts. Earlier in the year, in a moment of weakness, I purchased P90X-2. After reading through the accompanying literature, I decided that the focus on core and stability sounded consistent with my goal to recover my knee and further enhance athletic performance. As I write this, I’m about one-third of the way through the P90X-2 series. And I have to say, the experience has been good. It strikes me as an excellent maintenance routine after completing initial rounds of P90X and Insanity. I took a modified recovery week here, but didn’t include in the 90 day countdown. 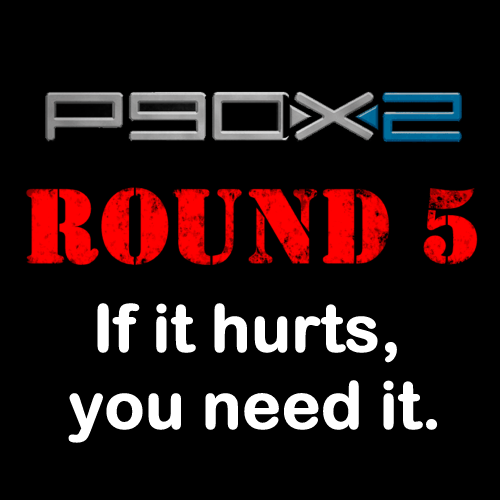 This entry was posted in P90X2, Round 5 and tagged P90X-2 Schedule, P90X2, Schedule. Bookmark the permalink.